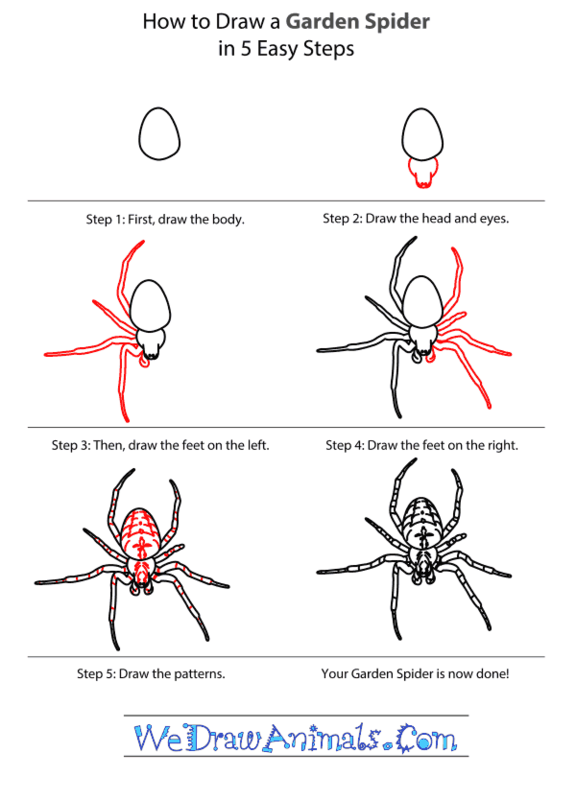 In this quick tutorial you'll learn how to draw a Garden Spider in 5 easy steps - great for kids and novice artists. At the bottom you can read some interesting facts about the Garden Spider. Step 1: Let's start with the body of the spider. 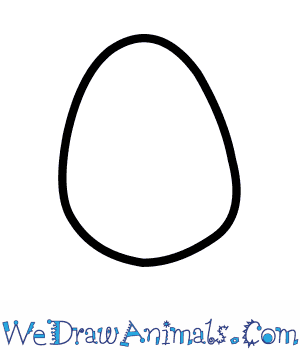 First, draw an egg shape. The Garden Spider has a smaller body compared to his legs, unlike other spiders. 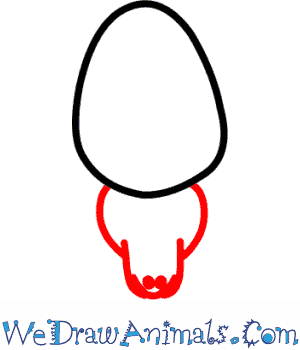 Step 2: To draw the head, start with two curved lines and then end it with a 'U' shape at the bottom. Add the eyes by drawing two smaller curved shapes at the very bottom. Step 3: Now let's draw the feet on the left side as shown in the picture. The Garden Spider has long legs for climbing, making its' web, and catching prey. Make sure to make the legs pointed at the end! Step 4: Add the legs and feet on the right to match the ones you drew on the left. Keep the ends of the legs pointy! 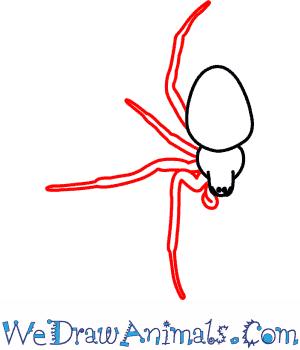 Step 5: Next, add the pattern on the Garden Spider by drawing small lines throughout the head, body, and legs. As you can see body has a unique pattern, there is a cross-shape in the middle and a rectangle shape near the back. To color your Garden Spider, use brown, black and yellow. 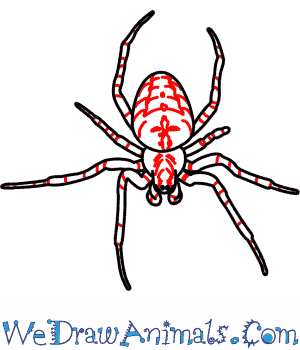 Get creative coloring the pattern…Garden Spiders have many different patterns. You can also add a large web behind the Garden Spider as well. 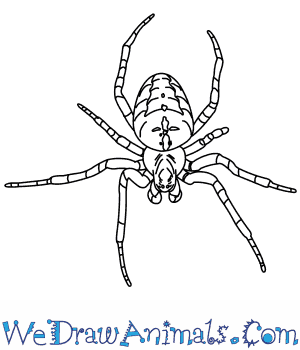 A Garden Spider is one of the most common spiders in England. They can also be found in America in New England, and southern Canada. They can be found in gardens, meadows, woodland areas, and hedges. The male Garden Spider is 5.5 to 13 millimeters long, but the females are much larger. A female Garden Spider is normally 6.5 to 20 millimeters. This size difference can be a challenge during mating. If a male isn’t fast enough, then he’s her dinner. Garden Spiders can be a lot of colors from a pale yellow to a very dark grey. 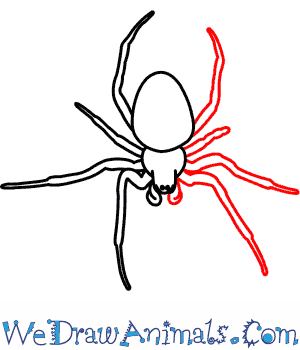 All spiders have 8 legs; two are long and measure the vibrations on their webs. The next two are used for walking, and the rest help with the web spinning. The average Garden Spider spins a round-shaped web that measures 40 centimeters diameter. When waiting for prey, a spider will always sit underneath the web. Every day a Garden Spider will eat their web, and then spin a new one by the next day. Spider webs used to be used in folk medicine to cure wounds. Spiderlings (baby spiders) hatch together and stay together until they are ready to go build their own webs. Activity: Gather up paper plates, pipe cleaners, glue, yarn, and craft google eyes. Allow each child to color their paper plate. Then glue eight pipe cleaners around the sides. Punch a hole in the top of the plate and run yarn through it. When the spider is finished add a pack of google eyes to the center of the plate. Hang the spider up to get the right look.